TherAbilities’ Friendship Group is a therapeutic environment fostering social relationships and self-regulation skills for children and youth. 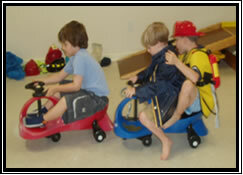 Groups are designed to enhance the social awareness and interpersonal skills of children with developmental challenges. Social language and social cognition are central elements of this program. Friendship Group schedule includes developmentally appropriate play, cooperative and recreational activities, and facilitated discussions. Parent meetings explain our curriculum and help ensure carryover of skills to be practiced in home/community settings. First-time applicants must schedule an intake appointment to determine group readiness. Intake fee is $95. $400 fee for each 8 week session of Friendship Group. Payment is due on or before the first group meeting. Applicants are registered in the order received. Group size is limited. Please give at least one week’s notice of cancellation. TherAbilities reserves the right to cancel a group and will notify applicants as early as possible if this should be necessary. TherAbilities’ Therapeutic Summer Day Camps are designed and co- led by our early childhood educator, occupational, physical, and speech therapists. Children socialize with peers while working intensively on their personal therapy goals. Children who have previously enrolled at TherAbilities will receive first priority. A preregistration interview is required for any children new to TherAbilities’ programs.